We are pleased to announce the availability of the April update the Power BI gateway. This release has a number of great new features, including one of the most popular requests: UPN mapping. Starting today, customers using Analysis Services with the Power BI Gateway will be able to set up their own UPN mapping rules. UPN Mapping enables gateway admins to apply custom security rules by mapping users’ cloud identity to specific on-prem roles or identities, via Effective User name and CustomData properties on an AS connection. 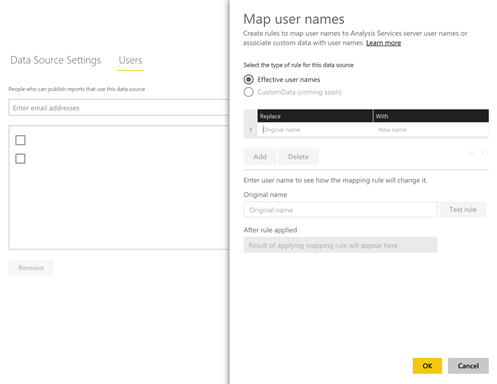 To start creating new mapping rules, you need to go to the “Manage Gateways” option from your Power BI dashboard, and then choose the Gateway and Analysis Services server to which you want the rules to be applied. Click on the Users tab and notice the new “Map user names” option. This will open the UPN mapping rules pane and you can start creating rules, changing their order, and testing the user names that you’d expect to change based on the rules. These rules will be applied to the selected data source only and not the whole Gateway. Please note that you need to be a Gateway Admin to set up or modify these rules. With this update we are adding support for refreshing datasets and reports that include SAP Business Warehouse Server data using the gateway. If you have tried the new SAP Business Warehouse connector available in Power BI Desktop as a Preview feature, you probably have noticed that scheduled refresh via the Power BI Gateway wasn’t available yet. With this gateway release you will be able to set up a scheduled refresh using your Enterprise Gateway, by choosing the SAP Business Warehouse option in your data source configuration for your Gateway. We are now supporting Enterprise Gateway connected Analysis Services models directly from within the Power BI “Get Data” experience, which means you can start creating your Gateway-configured AS data sources right from within the Power BI service. The only Gateways you will see in the list are the ones for which you’re either an admin or a user. If you are still using the AS connector, note that support for SQL Server Analysis Services Connector has ended, and databases connected using this method no longer appear in the Get Data experience. Only databases connected using Power BI – Enterprise Gateway appear. To upgrade, follow the steps here. A new Personal Gateway release is available. It includes some improvements and bug fixes. That’s all for this update. We hope that you find these features valuable and continue sending us feedback on how to make Power BI gateways even better. Please don’t forget to vote for other features that you would like to see in Power BI gateways in the future.